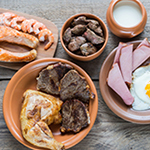 THURSDAY, March 3, 2016 (HealthDay News) -- There may be something to those high-protein diets, with a new study finding that protein does make you feel full sooner. Many people boost their uptake of meat and other protein-rich foods when trying to shed excess pounds, because they believe it will help them feel fuller while consuming fewer calories. However, there's been a lack of large studies to confirm that idea, noted a team led by nutrition researcher Richard Mattes of Purdue University, in West Lafayette, Ind. His team analyzed the available data from numerous studies on the issue. The new study concluded that protein does, in fact, make people feel fuller more quickly. The findings are published March 3 in the Journal of the Academy of Nutrition and Dietetics. "A good deal of evidence suggests that protein activates satiety [fullness] hormone release and so should be most strongly tied with fullness ratings," Mattes, director of Purdue's Ingestive Behavior Research Center, said in a journal news release. However, "individual studies are often conducted in small populations or with different approaches that can make interpretation of results challenging. Our study combined multiple experiments to confirm the presence of an effect," he explained. But while protein may help dieters feel full, it is not a magic bullet for weight loss, the researchers emphasized. "Feelings like hunger and fullness are not the only factors that influence [calorie] intake," Mattes said. "We often eat for other reasons. Anyone who has ever felt too full to finish their meal but has room for dessert knows this all too well." And just how much protein is needed to feel full? Study co-author Heather Leidy, an assistant professor of nutrition at the University of Missouri, said that issue is still "not resolved." Still, a moderate increase in protein intake may be a good first step for people trying to lose weight, the researchers suggested. "If these effects are sustained over the long-term -- and our study only looked at short-term effects -- increased protein intake may aid in the loss or maintenance of body weight," Mattes said. Two nutrition experts said the study is helpful, but the long-term effectiveness for weight loss of protein-heavy diets is still uncertain. "While this information may be useful to spur additional studies on this topic and how it relates to calorie intake and weight, we cannot conclude that more protein means more weight loss," said Erin Keane, a nutritionist at Lenox Hill Hospital, in New York City. "The studies [examined in the new review] differed greatly in the amount of protein eaten, as well as the amount of overall calories eaten at a given sitting," she noted. "Also, the studies did not provide insight into whether or not increased fullness actually led to decreased overall intake in a given day." Dana Angelo White is a nutritionist and clinical assistant professor of athletic training at Quinnipiac University in Hamden, Conn. She said that the new finding "reinforces messages that registered dietitians currently give." According to White, "The exact amount will vary, but ideally consume a variety of types of protein, both plant and animal-based, distributed throughout the day. This will not only combat hunger, it will provide the body with the amino acids it needs for things like muscle health, immunity and hormone production."